Minka Aire fans span many different design styles, allowing everyone the chance to find a ceiling fan that will work well with the rest of the décor. With Minka Aire, your ceiling fan will not be an exception to the style choices elsewhere in the room. Are you looking for a fan to complement your warm and cozy living room? Perhaps you favor a rustic feel, with accents in wood and plaid? The F905 Artemis XL5 ceiling fan will serve as an exquisite addition to your home. 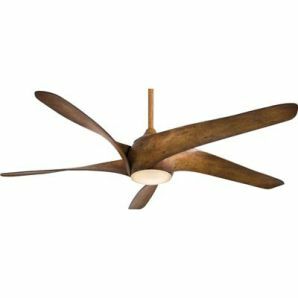 With five 62” blades that are constructed of wood with a distressed finish, this ceiling fan will cool you down just enough to make use of the blankets that are draped across the back of your couch. If the cabin feel isn’t your style, the F853 Aviation ceiling fan offers a chic and modern alternative. Sporting three 60” blades with a brushed nickel finish, this piece looks more like an airplane propeller than a ceiling fan. This Minka Aire fan will look great surrounded by the stainless steel appliances and clean white accents of your contemporary kitchen. When you choose to purchase a Minka Aire fan from Crescent Harbor, you can rest assured that you are investing in a quality product. We have a large selection of affordable lighting solutions that look like they are high-end, while also carrying handmade lighting fixtures that look like stunning works of art. We have exactly what you need to decorate your home the way that you want. Since we are a family-owned business, we are committed to providing our customers with quality pieces at a reasonable price. We treat our customers like family! We look forward to getting to know you as we work together to make your lighting dreams a reality. Our design professionals are always ready and willing to assist you. Feel free to call us at 1-888-355-9525 to get started.